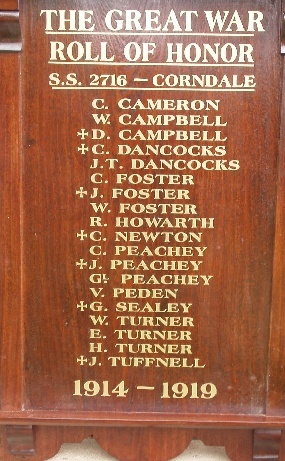 The following names are from the Corndale State School Honour Roll (near Casterton in south-west Victoria, Australia) commemorating ex pupils who enlisted in World War 1. The additional information column is from attempts to identify all individuals named on the Honour Roll. CAMERON, C Andrew Alexander Clarence CAMERON (Clarence CAMERON, ex 'Tullich'), b. 1896, son of Andrew CAMERON and Louisa BOARDMAN WW1 CQMS 18, 8th Infantry Brigade HQs, enlisted 18-07-1915, RTA 20-06-1919. CAMPBELL, W William CAMPBELL (ex Corndale), b. 1879, Corndale, son of Marion (Sarah) CAMPBELL who later married James Craig STEWART. WW1 Pte 1637, 1st Div, Salvage, Co, enlisted 3-04-1916, RTA 9-07-1919. + CAMPBELL, D Dugald CAMPBELL (ex Corndale), b. 1884 Corndale, son of Neil CAMPBELL and Mary Ann McQUEEN. WW1 Tpr 1449, 4th Light Horse Regiment; Wool Classer, enlisted 2-08-1915, DOD 16-11-1916 at sea. Name : Casterton War Memorial. DANCOCKS, J John Thornton DANCOCKS (ex Corndale), b. 1870, Casterton, son of John Thornton DANCOCKS and Mary Jane Agnes FOSTER. WW1 Tpr 5013, 5th Light Horse Regiment, Palestine, Gallipolli, enlisted 11-01-1915, RTA 21-01-1917. + DANCOCKS, C Gilbert Cunningham DANCOCKS b. 1888, Casterton, son of John Thornton DANCOCKS and Mary Jane Agnes FOSTER. WW1 Pte 118 H Cy Depot, died Broadmeadows Army Camp; Wool Classer, Station Manager. Charles James Hepburn FOSTER, b. 1894, Casterton, son of Thomas Hayford Lexington FOSTER & Margaret McCALMAN. WW1 Gnr 3631, 4th Bty, 2nd FAB, Gallipoli (Sick), France, enlisted 5-11-1914, RTA ___, Farmer. + FOSTER, J James Gordon FOSTER, b. 1887, Casterton, son of John FOSTER and Emma HOOK. WW1 Pte 3340, 2nd Aus Pioneers, DOW 4-10-1917, Belgium. FOSTER, W William Henry FOSTER, b. 1885, son of John FOSTER and Emma HOOK WW1 Pte 2000 or 2909 William Henry FOSTER, 43rd Battalion, AIF, enlisted, Adelaide, SA. RTA ___, died 1958, buried in the Casterton Cemetery. Appears to be Robert Arthur HAWORTH 1871-1943, b. Merino, Victoria, son of Robert HAWORTH and Jane HETHERINGTON. WW1 recorded as Robert Arthur HOWARTH, Pte 1486, 4th Light Horse Regiment, AIF; enlisted 14-07-1915, RTA 15-06-1919. Died while on service in WW2. Memorial Tree : Digby WW1 Avenue of Honour. + NEWTON, C Charles Henry NEWTON, b. 1894, Casterton, son of Henry NEWTON and Mary 'Kate' McCOMBE. WW1 Pte 1700 39th Battalion, enlisted 3-04-1916, KIA France, 24-08-1918. PEACHEY, C Charles PEACHEY, b. 1895, Casterton, son of John Saunders Wyld PEACHEY and Alice GORRY. Not located on the WW1 Nominal Roll nor in National Archives at this time. PEACHEY, G Giles PEACHEY, b. 1887, Casterton, son of John Saunders Wyld PEACHEY and Alice GORRY. WW1 Pte 3203, 6th Division Infantry Detail, enlisted 25-10-1916, RTA 19-10-1917. + PEACHEY, J John Edward PEACHEY, b. 1890, Casterton, son of John Saunders Wyld PEACHEY and Alice GORRY. WW1 Pte 3204, 58th Battalion, enlisted 25-01-1916, KIA Messines, Belgium 13-03-1918; Groom. PEDEN, V Vivian 'Vic' Everett Sutherland PEDEN, b. 1899 Casterton, son of Thomas Sutherland PEDEN & Kate Mary DANCOCKS. WW1 Spr 52584, 1st Division Signal Coy, enlisted 19-09-1917, RTA 23-07-1919. + SEALEY, G George Henry SEALEY, b. 1896, Casterton, son of William Edward SEALEY & Mary Ann BEST. WW1 Pte 1777, 24th Battalion, enlisted 23-02-1915, KIA Pozieres 29-07-1916. TURNER, W William Thomas Patrick TURNER, b. 1882, Corndale, near Casterton, S-W Victoria, son of John TURNER & Eliza LORD. In December 1914 he was a laborer, single, aged 32y of Corndale when he enlisted in the AIF on 15-12-1914 as Tpr 8987, 4th Light Horse Brigade Train (ASC), AIF. He served in Egypt & Gallipoli, then in France as Dvr 8987, 2nd Division Train (ASC), AIF and RTA 9-03-1919. He did marry and died Adelaide, SA in 1963. TURNER, H Henry Ernest TURNER, b. 1892, Corndale, near Casterton, S-W Victoria, son of John TURNER & Eliza LORD. In August 1916 he was a teamster, single, aged 34y of Corndale when he enlisted in the AIF on 1-08-1916 as Tpr 3069, 9th Light Horse Regiment, AIF. He served in the Middle East 1917-1919 as Tpr 3069, 3rd Light Horse Machine Gun Squadron, AIF and RTA 10-07-1919. In 1921 at Mount Gambier, SA, he married Myrtle Mary MORESEY 1896-1972 who was born in Casterton, Vic. They had at least 5 children at Mount Gambier where Henry died in 1969. TURNER, E Edward John TURNER, b. 1879, Corndale, near Casterton, S-W Victoria, son of John TURNER & Eliza LORD. Married Rose Ann Mary KOSSATZ 1886-1954 in 1904 at Penola, SA. In July 1916 he was a Teamster, married, with 4 children, of Mount Benson, South Australia. He enlisted on 15-07-1916 as Pte 3068, 9th Light Horse Regiment, AIF. He served & suffered severe illness in the Middle East and RTA 8-08-1918 and died at Mount Gambier, SA in 1929. + TUFFNELL, J John TUFFNELL, b. 1883, Casterton, son of Robert TUFFNELL & Mary Ann FOSTER. WW1 Spr 6556 14th Field Coy Engineers, enlisted 26-08-1915, KIA Belgium, 30-10-1917.